Why not take a trip and have us worry about all the details? At Appleton Parks and Recreation we are happy to offer special destination bus trips, focusing on providing an enjoyable and fun experience for participants. 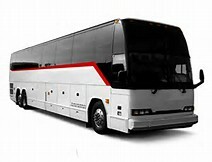 Transportation for these trips is a deluxe motorcoach with a restroom. You can sit back and relax without the worry of traffic, parking and trip details. Trips are designed for a variety of interests and we hope you can join us on one or more of the following adventures! For questions regarding any of the bus trips, contact Chelsey Latimer at [email protected] or 832-3927. It’s back! Our most popular bus trip of the year! Let us take care of the stress of driving in and out of Chicago and you can have all the fun! Whether you are in for the sights, the shopping or the amazing restaurants, there is something for everyone in downtown Chicago. *We do know that this is Easter weekend, please take that into consideration when making your plans. TIME: 6:00 a.m. – 9:00 p.m.
Motor coach will leave from the Facilities and Grounds Parking Lot in Appleton Memorial Park at 1819 Witzke Blvd. at 6:00 a.m. and will return approximately 9:00 p.m. This fun, family-oriented festival is a favorite of many drawing up to 100,000 people annually to celebrate the strawberry, enjoy live music, browse and purchase original artwork from hundreds of artists, and enjoy some of the most decadent homegrown strawberries in the area. Motor coach will leave from the Facilities and Grounds Parking Lot in Appleton Memorial Park at 1819 Witzke Blvd. at 8:30 a.m. and will return approximately 6:30 p.m. Enjoy all the lovely fall colors as we explore three of the best places to stop in Door County: Sister Bay, Fish Creek and Egg Harbor. Bring a friend and enjoy the Fall Festival in Sister Bay, the shopping ,the great food /wine and gorgeous sightseeing . Space is limited, register today! Motor coach will leave from the East Parking Lot in Appleton Memorial Park at 1620 Witzke Blvd. at 7:00 a.m. and will return approximately 6:00 p.m.